There is no greater pleasure than to meander around my neighbourhood on a beautiful spring day, pointing out the blossoms and buds to the Baberoo – who giggles and claps with joy to see such beauty – and then to continue into Headington for a leisurely breakfast. 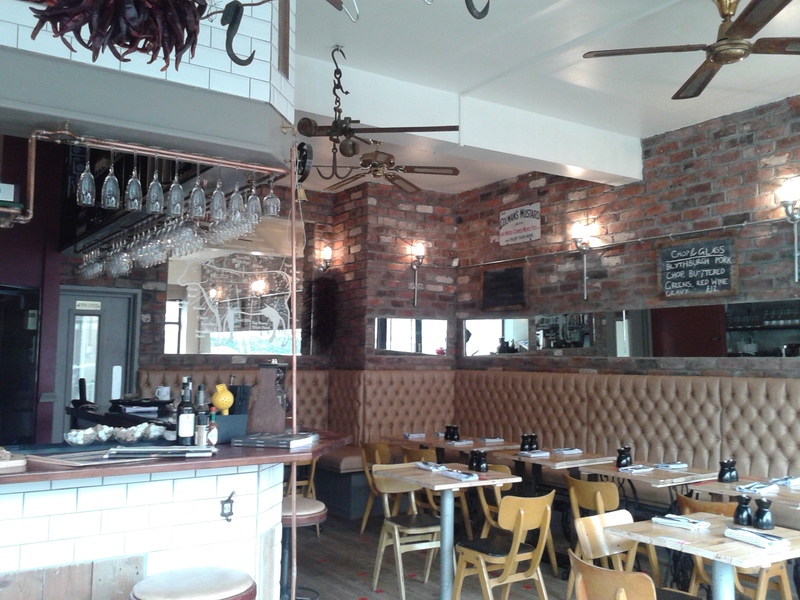 Today we tried out Jacobs Chop House (3 Manor Buildings, Osler Road, OX3 7RA), our newest neighbourhood establishment. The Chop House is the third venture for the partners behind Jacobs & Field and Jacobs Inn, and it’s a welcome addition to Headington, taking over the premises of the now-closed Cafe Noir (which lives on at Coco Noir just down the street). I’ve given favourable reviews to both Jacobs & Field and Jacobs Inn, and I was hoping that I would enjoy my experience at Jacobs Chop House just as much. And I sure did. 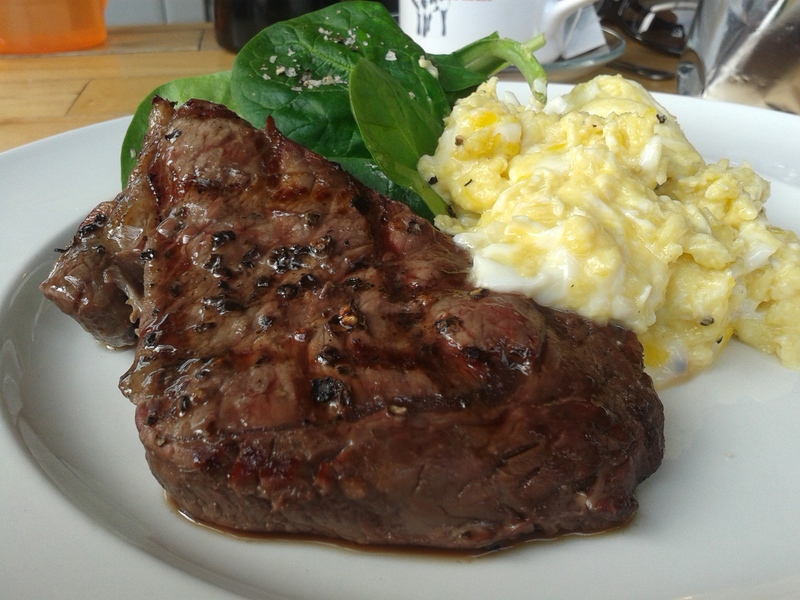 I ordered the steak, eggs, and spinach (‘Breakfast of Champions’, £8.50) and was treated to one of the best steaks I’ve had in ages, brought up to me from the basement kitchen by the chef himself. You might not expect a breakfast-dish steak to be as tasty and succulent as a dinner steak, but boy, was it ever. I enjoyed every bite, except for the one tiny corner I permitted the Baberoo to have. She was more into the eggs anyway: she commandeered them and I hardly got any. The spinach was served raw and was bursting with freshness. 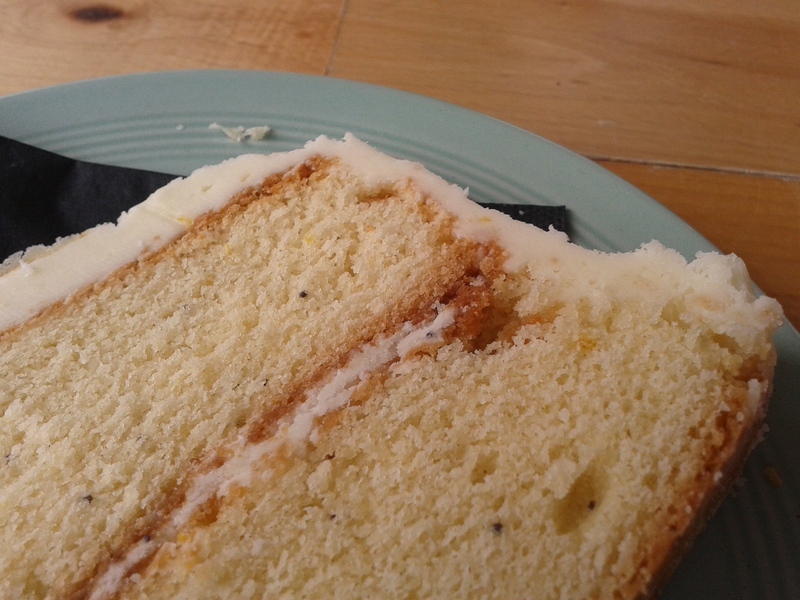 In my book it is just fine to order cake no matter what time of day, and there was a pretty tempting-looking lemon poppyseed cake on the counter. It was nice and moist and the icing was excellent. Jacobs Chop House, as the name suggests, revolves mainly around meat, and their menu offers lots of chops: lamb chop, veal loin chop, bacon chop, steak, etc. But there are also some other interesting dishes on the menu: slow-roasted beef short rib, grilled cod cheeks, and ‘London particular soup’, which I may well have to investigate very soon. I think it’s settled: I now have a go-to restaurant in my neighbourhood. So, how did Jacobs Chop House rate for baby-friendliness? My ratings system takes into account menu, space, ambiance, facilities, and feeding (more about these on my About page). Menu: As mentioned above, the menu is mostly meat, with lots of chops that definitely require the use of both hands. So if you need to hold your baby in one arm, there are only a few large plates that you can comfortably eat using one hand. There are a few options available in the ‘smaller plates’ section of the menu. But still, if you’re going to go to a Chop House, you might as well go for the chops – which means making sure that your baby is either sleeping or happy enough to sit in a high chair so you can use both hands for eating. Space: It’s a small space but it seems bigger than it is because of its high ceilings and clever use of mirrors. Still, there’s probably only room for a maximum of three pushchairs in the whole restaurant, otherwise there wouldn’t be room for anyone to move around. We used the lone table on the left side, near the counter with stools, and there was plenty of room for our quite large Uppababy Vista, but that was also because the place wasn’t full. I imagine that at lunchtimes, and especially dinnertimes, it can be a very tight squeeze. There’s more seating downstairs but unless your pushchair folds up easily it’s probably not an option. Ambiance: This feels like a place where you could hang out for hours, nibbling at various plates, sipping a coffee, and just reading a book or talking with friends. It has an easy, relaxed feel about it. The staff were very friendly and our server asked the Baberoo’s name and was interacting with her the whole time. They were helpful in getting a high chair set up and opening the door for us to get in and out (although it’s a pretty easy door and there are no steps, which is great). Facilities: Kudos to Jacobs Chop House for providing a baby-changing facility in what are some pretty tiny bathrooms – I had originally feared that there might not be a changing facility, but there is. It’s in one of the unisex loos downstairs (the one on the right), so you’ll have to leave your pushchair upstairs and walk down with the baby. 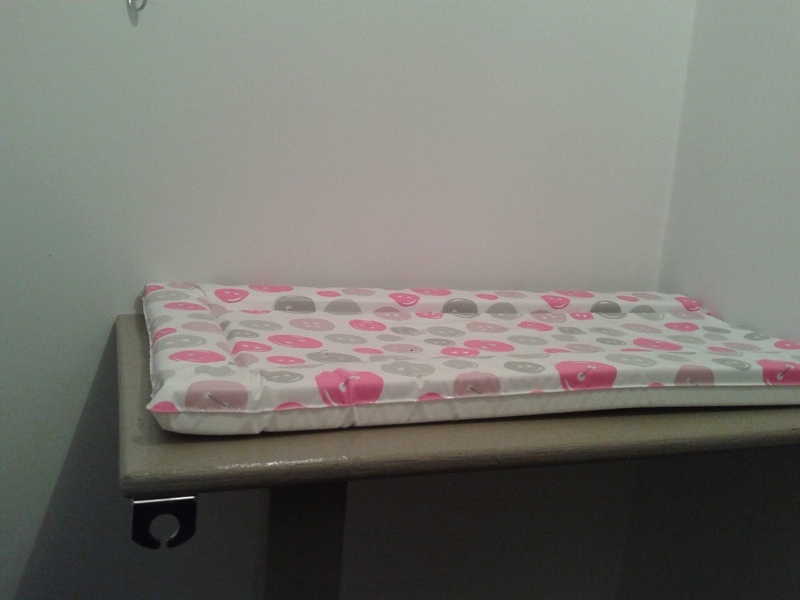 The changing table is in a very small entry space outside the actual toilet cubicle. Remember to lock the outer door, otherwise you might get whacked by someone else trying to get into the bathroom. The changing table itself is a wooden shelf with one leg supporting it, very much like the one at Jacobs Inn but sturdier-feeling. There isn’t anywhere to put your bag and the changing table is quite small, and there also isn’t any access to the sink, which is inside the toilet cubicle behind a fairly heavy door. But they have made the effort and done a pretty good job with the space they have. The final score for baby-friendliness for Jacobs Chop House is 7.0 out of 10. They do very well with the small space they have available, and the ambiance and friendly service makes it a place you’ll want to return to again and again.